The biggest birthday card you’ll ever see. Of course, it’s not really a card, and you can’t open it to read what’s inside. But what a great way to send a birthday greeting, telling everyone for miles around whose birthday it is, even if they don’t know the person. It also shows more effort than a store bought card, since the maker has to climb over or through the fence on the Hana Highway, lugging cans of paint or spray cans, maybe even a ladder, and of course, nightlights to see with while doing stealth mural painting in the wee hours. The Hookipa pillbox mural can also be used for mourning, as a supersize sympathy card. Here’s a recent mural from August of this year. It took me a while to figure out who Po'o was. Sympathy mural for Po'ohala Atay. Dania Katz had posted a photo on Facebook asking why these street signs were decorated with ti leaves in Wailuku. One person responded that it was for Po’ohala Atay. Bingo! Turns out Po’o was a very handsome, likeable man of Hawaiian ancestry, who died far too young. In honor of Po’o, someone painted this wall-size condolence, which can be seen by anyone driving past Ho’okipa. 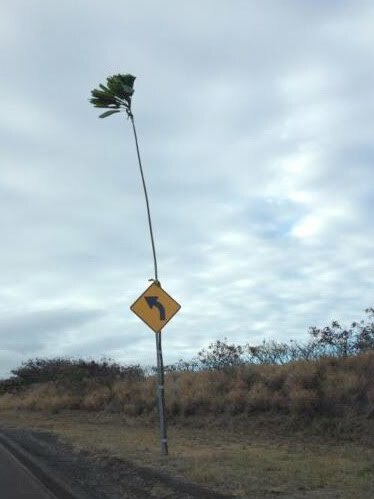 Ti leaf stalk attached to a street sign in Wailuku for Po'o Atay. I found out later that this was a kahili, a Hawaiianroyal emblem or standard, and that these kahili were placed along signs leading up to the reception for Po'ohala Atay's memorial service, but that the police removed them, thinking they were part of a protest of Native Hawaiians against the Four Waters controversy. Photo courtesy of Dania Katz, originally posted on Facebook. It’s not the first time the pillbox structure on the Ho’okipa bluff has been used to commemorate the passage of a loved one or departed friend. Last year in November, actually right about now, the pillbox mural displayed a clear message: RIP Turtle. This condolence was for “Turtle” Tristan Brennan, another young man who died far too young. Again, like Po’o Atay, Turtle died under very mysterious circumstances, and his body was found in a pineapple field. This is actually a little over a year after his death. I’m sure his family and friends are feeling the loss sharply right now. They created an "Aloha Turtle" video with surfing scenes. What is it about young local men dying too young? May they rest in peace. Or better yet, maybe they are having fun together somewhere. Maui is such a small island, Turtle and Po'o could have easily known each other and they were practically the same age. Rest in Peace Turtle Brennan. I don't mean to get anyone down. Death and birth are part of the cycle of life. Every death has meaning, every birth has meaning. We can't bring back people from the dead, but we can live our precious lives fully. If this weekend were your last, how would you live? What would you do differently? There's a new mural that's been painted but I didn't have a chance to take a picture yesterday. The wall gets repainted frequently, experiencing death and birth as well. It's death to the old mural and birth to the new one. I look forward to the new one. Update 5/14/13: I recently met Janet, the mother of Po'ohala at the Maui Art of Trash exhibit when I was volunteering. She was a beautiful and gracious woman and I felt a rush of sympathy for her though I hardly knew her. She told me that the night that Po'ohala's friends painted the mural at Ho'okipa, they didn't need any light since there was a meteor shower. All night, they painted under falling stars. Just writing this sentence gives me chicken skin (shivers), in a good way. I'm updating this post after Mother's Day, and the timing feels right. Though Po'o and Turtle Brennan are not physically here, I feel that they are somehow here in spirit, and that their mothers also need our support and blessings.